Page view compliments of MEDICOM, Inc.
Pro-Matrix are single-use bands used in placing Class II direct restorations. Each band is pre-assembled in a plastic retainer with a tightening mechanism. Bands are available in two sizes: Wide 6.5mm and Narrow 4.5mm. A sliding deflector is adjusted to constrict the cervical side of the band, making each unit universal for use in any quadrant. 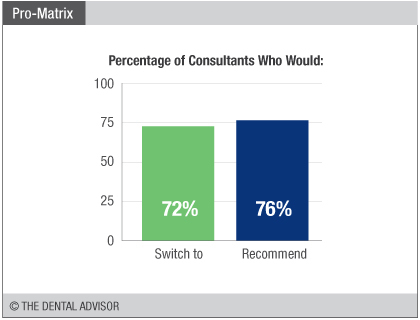 Pro-Matrix was evaluated by 32 consultants in 843 uses. 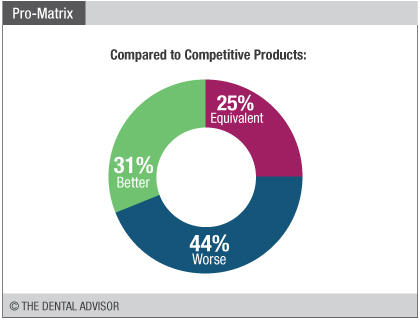 This matrix band received a 91% clinical rating. 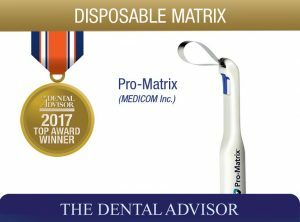 Pro-Matrix is simple for dental assistants to set up and is ready to use right out of its individual cellophane wrapper. It slides easily over the tooth, and the retainer handle is smooth against the patient’s cheek. Colored handles (blue and green) provide clear visualization of wide or narrow size. The deflector slides smoothly to narrow the cervical side of the band, and the tightening mechanism adjusts effortlessly to snug the band around the tooth. The adjustment screw is completely enclosed within the plastic housing, protecting patients’ soft tissues from trauma. 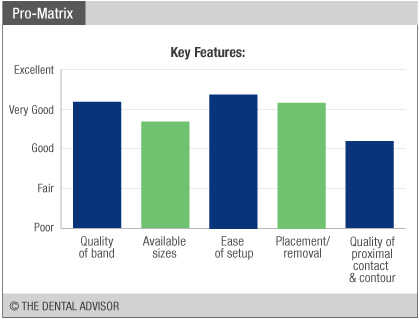 The Pro-Matrix band is less contoured than traditional bands and performs best in cases without a wide interproximal space to span.